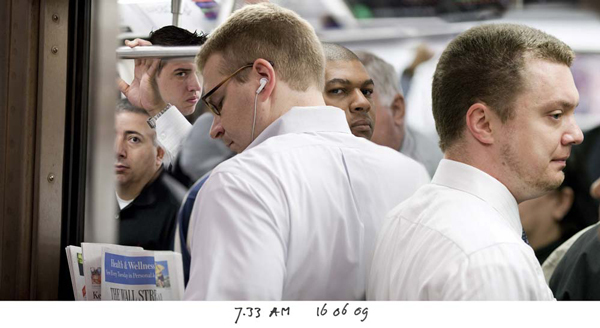 Although experimentation with the accurate depiction of reality is nothing new to the field of photography, Dutch artist Reinier Gerritsen and the seductively life-like composite images of Wall Street Stop mark a new chapter in the street photograph. 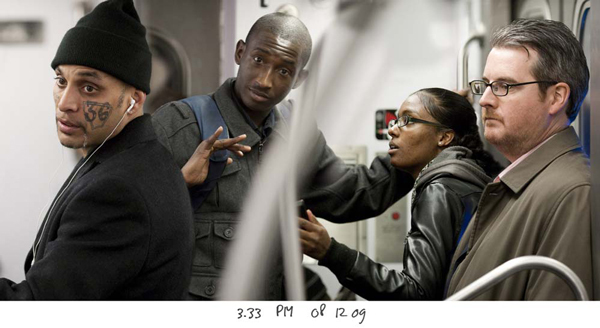 Gerritsen shows us constructed assemblages of subway passengers photographed moments before feeling the inertia pull of trains passing through one of the epicenters of the 2007-09 financial crisis. As such, Gerritsen’s images are infused with the history of the times, the staged quality of a Renaissance tableau vivant, and the busy snapshot poetry of street photography. Luke Shaw: Let’s start out with a bit of personal history. What fascinations first drove you to create photographs? How do you see these foundational inclinations shaping Wall Street Stop? Reinier Gerritsen: I was educated as a filmmaker at the Free Academy with Frans Zwartjes, and at the Photoschool in The Hague. Zwartjes’s approach and visual intelligence inspired me greatly. In the nineties, I was asked to do the major annual Rijksmuseum assignment, a vast documentary project about the corporate culture in The Netherlands. Documentary projects have always been, besides portraits, my main occupation. (‘Airport’ and ‘Matti’) As a fifteen year old boy, I bought a book with a selection of Memling’s work that I cherished. 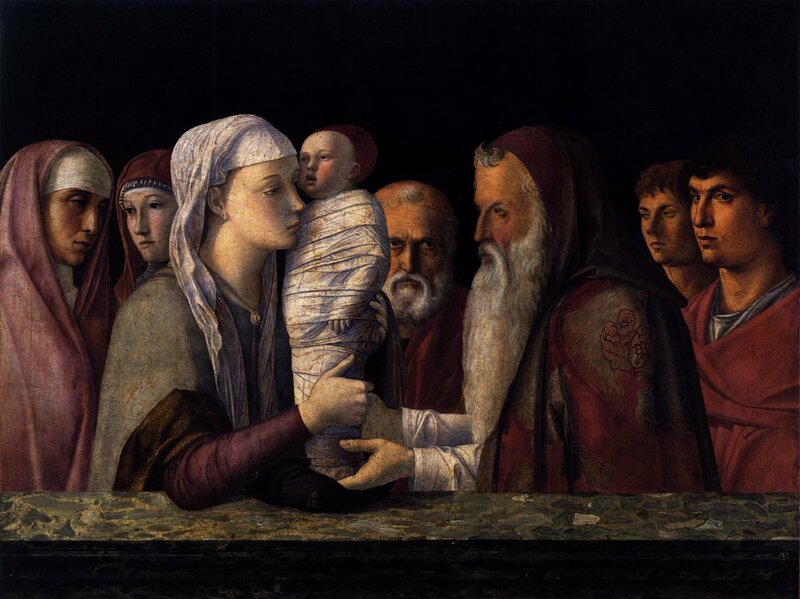 I had a reproduction of ‘Presentation in the Temple‘ by Bellini above my bed, next the the [Rolling] Stones of course. LS: At first glance, the images from Wall Street Stop bear the marks of a traditional street photography project, but close inspection reveals indications of the artist’s hand. 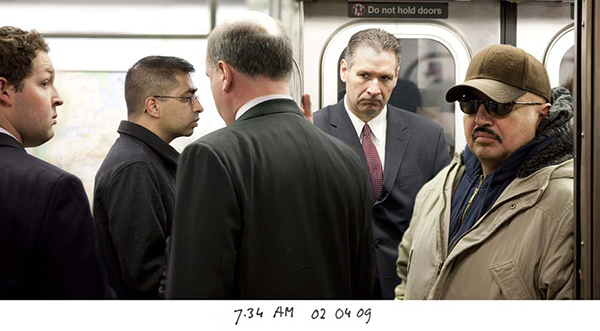 Wall Street Stop is a series of carefully composited images. The only traces left of the process are some unusual variations in light and depth of field – the effect is actually almost surreal. I think any photographically knowledgeable person could pick up on this subtle breakdown of the archetypal street photograph. What’s the functionality of being coy with your viewers in this way, of constructing an almost 100% convincing collage? RG: I’ve always liked the richness of details and that everything is in focus. This is why I like the Dusseldorfer Schule, photographers like Gursky and Struth, again the ‘Presentation in the Temple’ and the Dutch militia paintings. When I discovered that it was possible to get every detail in focus with a simple photoshop/layer-trick, the decision was quickly made. I could now achieve the sharpness of the view camera with my single lens reflex. The quality of these photographs was enhanced by the latest technical advancements in digital cameras. Let me tell you about how I work: I wander around, and a few times a day I see a combination of people, a group, who have the specific qualities I’m looking for. At that moment. within a few seconds, I make ten pictures whereby I direct my auto-focus in every shot on the next person in the group. Later at home, I glue these pictures together to form the initial situation I photographed on that specific time and place. A reconstruction of reality. It looks a bit surreal, but you should rather call it real or ‘super-real’. The image gets a special flavor. LS: I think one of the most poetic components of this work is its depiction of stillness at a moment of impending motion. That somehow seems opposed to a classically photographic logic. I think we are inclined to freeze motion as it occurs with our cameras in order to capture some imperceptible stillness. Instead, you stood and waited for the moment beforehand, which may be equally as imperceptible. What did you see during this very specific moment that inspired this series? RG: On my wanderings, I come across a lot of situations or groups that I could photograph. However, there are only a few a day that I really want to capture. And why do I choose that specific group? The lighting on the faces is one of the main reasons, and then the variety in the group, their posture, the richness of the details, and much more.. It is this very intuitive choice that lies at the base of my work. LS: In 2010, when you produced this series, the American economy was severely wounded and Wall Street in particular was at the stake. You chose a fairly significant time and place in America’s history, but the economic recession was quite global. 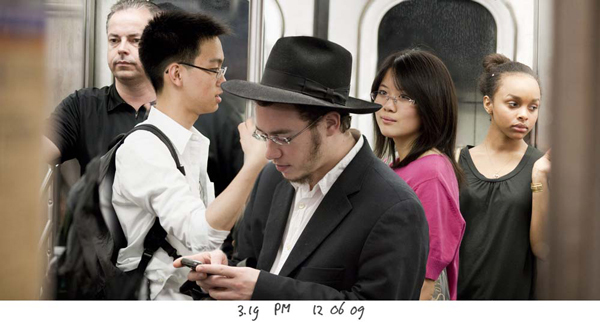 What about this particular situation inspired you to make a photography project in New York City? What was here that was nowhere else? RG: In 2008 I finished my project ‘The Europeans‘, a portrait of more than twenty cities. It was supposed to become a book but it was put on hold because of the financial crisis. That was one of the reasons why I decided to take pictures of that crisis. I spent weeks wandering around in London, Frankfurt and Paris, the European financial centers. I called the project ‘Money‘, but I wasn’t satisfied with the quality. In the beginning it didn’t work so well in New York either, until , after a week, I ended up in the subway. Now I’m more or less addicted to your subway. I was struck by the beautiful melting pot of individuals. And how they would stand almost completely still before the doors of the cars closed. A rare opportunity for photographers. In addition to this, I found out that on the lines four, five and six they had installed a new type of lighting fixtures which gave an interesting lighting on the various faces. LS: Typically, a social documentary-style photo project uses the “honesty” of the camera to provide a fair record of the times. You, quite unfairly, digitally composited your images into something like a social jigsaw puzzle. With that in mind, where do you think Wall Street Stop stands as a potential historical document? When the New York Times published the Wall Street Stop series, there was a discussion that came close to your question. Was Reinier Gerritsen an image maker, or a photographer? They finally decided on photographer. In the art world, and at my gallery Julie Saul, these notions are less relevant. Besides that, it’s not up to me to decide whether my work belongs in the social documentary canon or not. It’s up to others to decide if ‘Wall Street Stop’ is a historical document. 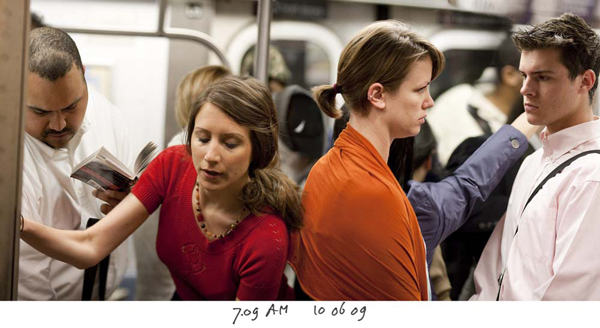 LS: As I look at your images I imagine you as some sort of cupid or matchmaker, putting the commuters in calculated proximity to perhaps share a longing glance or immediately engage in a fist fight. You are manipulating records of reality that contain fairly reactive constituents. I was wondering what you went through as you were playing the collage puppet master? Were imaginary screen plays running through your head? Did you feel as though you were creating tangent universes? RG: My starting point is recreating reality, so creating a new universe is not how I view my work. Nevertheless, I do put the emphasis on certain persons by stepping one meter left or right with my camera while shooting. A similar situation arises when I have to make the decision on which pictures I will use for a book. I’m now working with my designer Rene Put on the selection of photographs for my next book (‘The Last Book’, Aperture Publishers, Spring 2014.) And then you realize that by adding or skipping certain photographs you can change the tone of the book. LS: Aside from pouring through the subway shots, is there anything else on the horizon for you? RG: I am working now on a project about the bicycle tunnel under our Rijksmuseum. It’s a special project because I have mounted a little mast on my bike, with a camera on top. This is to take portraits of my fellow cyclists (inspired by the google car and the work of Andrew Bush). With my colleagues Theo Niekus and Hans Eijkelboom we are preparing an exhibition about street photography. This wil be on show next year in the Stadsarchief, adjacent to the Ed van der Elsken show (he is our Dutch master). Bio: Reinier Gerritsen is an Amsterdam-based photographer whose work spans the fields of social documentary and fine art. He has published a number of photo books including Blind Surprise (1993), Schiphol Airport (2000), Matti (2003), and Wall Street Stop (2011). He was awarded the prestigious Rijksmuseum-NRC assignment in 1992 to document corporate culture in the Netherlands, which concluded with a book, Bedrijfscultuur in Nederland (1992), and solo exhibition at Rijksmuseum. Gerritsen has exhibited internationally and is represented by Julie Saul Gallery.